At a critical for Europe’s future time, when the EU is at the crossroads to decide to what priorities it should invest money post-2020, hundreds of thousands of children are still growing up in institutional care in Europe. Even though institutions are often funded by public money – intended for the public good – they can have long-lasting damaging consequences not only for the children themselves but also for families and society as a whole. The negotiations on EU budget and funding programmes beyond 2020 is a unique chance for the EU to end the era of institutional care – unnecessary, outdated and harmful type of care that segregates children from society. The next Multiannual Financial Framework (MFF) offers a real opportunity to build on lessons learnt and deliver on existing EU promises. The undoubted EU added value of investing in the social inclusion of the most vulnerable people, catalysing child welfare and child protection reforms and triggering the transition from institutional to community-based care (also known as deinstitutionalisation) has been widely acknowledged by civil society in Europe (see the Opening Doors for Europe’s Children recent recommendations to the EU, Eurochild’s recommendations on investing in children through the post-2020 MFF and the European Expert Group’s position paper on the funding of the European Union post-2020). To continue this progress, coherent with the EU’s human rights obligations, and to ensure realisation of common values and objectives, such as poverty reduction or social inclusion, the EU must reinforce and expand its support towards transition away from institutions towards more individualised family- and community-based care, when negotiating the post-2020 budget and funding programmes over the next 18 months. 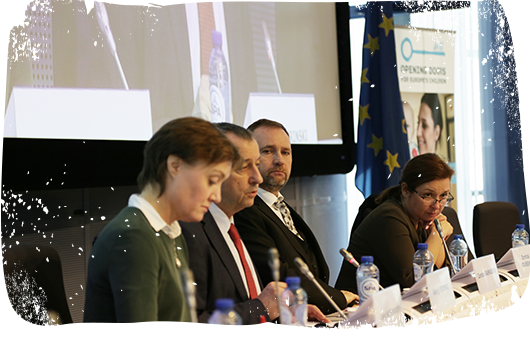 To enhance a pan-European debate on the EU budget post-2020, the Opening Doors for Europe’s Children campaign launched a publication during the event on 20 March. The new publication brings evidence from the ground on how EU funds have been used in the current Multiannual Financial Framework (MFF). It provides ample examples of why positive elements such as the ex-ante conditionalities and the European Code of Conduct on Partnership (ECCP) should be maintained in the future EU budget and expanded to other funding programmes. The report also raises some valid concerns about how regulations have been implemented in practice, making the case for strengthening existing regulations and providing recommendations for the next funding programmes beyond 2020.